This menu is part of the page "Celtic Knot of Tomatin" on "www.AvalonsTreasury.com". This Celtic knot of Tomatin aids in finding inner harmony and new opportunities. 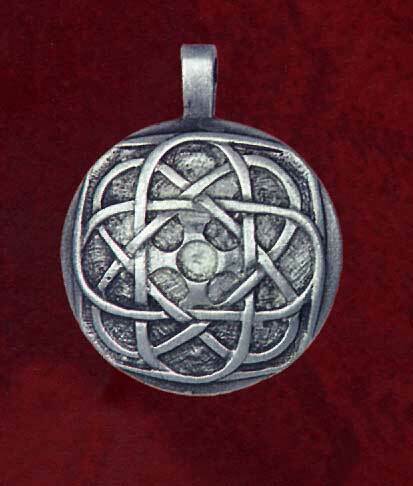 The uniqueness and the skillfull design of the symbolic pendants of the Celtic craftsmen is unsurpassed until today and they were therefore known in the whole world for their symbols made of various materials. The high quality of these pendants excelled them among their contemporaries as being artful and knowing: The Scottish Tomatin was christianized early but still continued to stand under the Celtic influence of the Highlands - after all it is one part of Kilsyth, a certain area in the Scottish Lowlands directly bordering the inhospitable Highlands. Because of this combination of cultures and religious beliefs very interesting new designs as e.g. the knot pattern of this pendant were created here. According to old beliefs this pendant uses the powers of the fairy realm and the spirits of nature to assist its wearer in finding love and harmony and to offer him opportunities in life. This jewelry belongs to the jewelry line up "Ancient Symbols". Website: Our short information is "Online Shop for Minerals"
Page: The Celtic knot of Tomatin assists in finding love, harmony and new opportunities.